The iPhone giant posted strong quarterly results early in the month while promising continued healthy growth ahead. Apple (NASDAQ:AAPL) shares soared 13% last month, according to data provided by S&P Global Market Intelligence. The rally not only set a new high for shareholders, it also helped push the broader Dow Jones Industrial Average to a record high as the tech giant's market capitalization passed $700 billion. 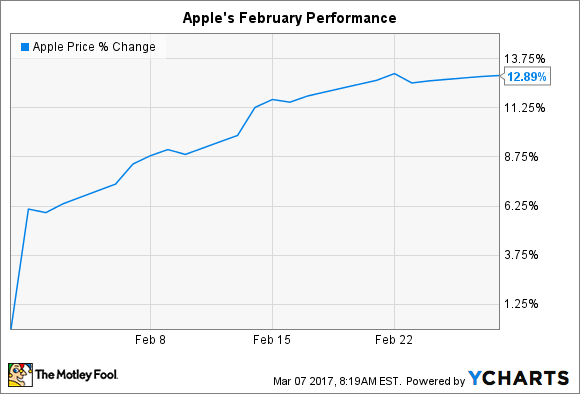 Apple's February spark came after the company posted quarterly earnings results that showed a return to growth following three consecutive quarters of declines. Strong demand for the latest iPhone models, plus a sharp jump in average selling prices, helped revenue tick higher by 3% as earnings surged to $3.36 per share to outpace consensus estimates that were calling for $3.17 per share. "We're thrilled to report that our holiday quarter results generated Apple's highest quarterly revenue ever," CEO Tim Cook said in a press release, "and broke multiple records along the way." Among those records were a best-ever result for the iPhone business, services, and the Apple Watch. Cook and his team are especially excited about their fast-growing services segment. That division has expanded to nearly 10% of sales, and soaring demand for apps pushed its high-margin revenue up by 18% to over $7 billion last quarter. Apple's guidance for the current quarter calls for no quick end to its growth days. Sales are expected to stop at between $51.5 billion and $53.5 billion, which would represent 2% gains at the midpoint of guidance. Wall Street is more optimistic, as consensus estimates call for a nearly 5% revenue jump to $52.9 billion. Yet many investors are already looking ahead to the 10th anniversary iPhone model that will likely include major tech upgrades and, ideally, spark a major upgrade cycle for Apple's biggest business.